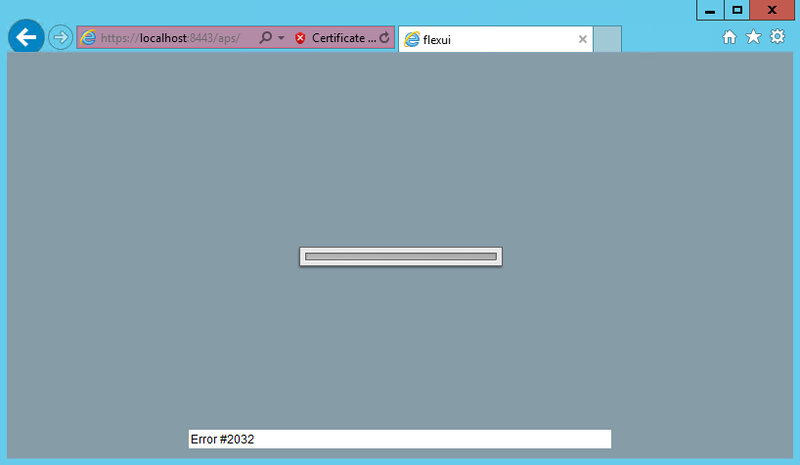 When you open EMC Secure Remote Services (ESRS) Policy Manager 6.6 URL “http://localhost:8443/aps“, you are unable to log in and the Policy Manager displays blue/gray screen with the “Error #2032” in the bottom center of the window. Policy Manager 6.6 requires that the web client have Flash 11 or above installed. The Policy Manager is complied with dynamic libraries that need to be updated and registered from the Adobe web site. If the customer has the Policy Manager in a locked down network environment that does not have internet access and cannot reach the Adobe Site to update the libraries the Error 2032 is displayed. To get this fixed, you can either permit Internet Access for the server hosting the Policy Manager or place specific files to the Policy Manager directories. Please refer to EMC KB Article 000188143 for details.